Notes on Signal Processing, etc. It was embarrassment for me to reply, “No, I don’t remember.” I was not smart! for large values of . That’s it! Most of the books and references say 13 dB, perhaps an integer approximation. 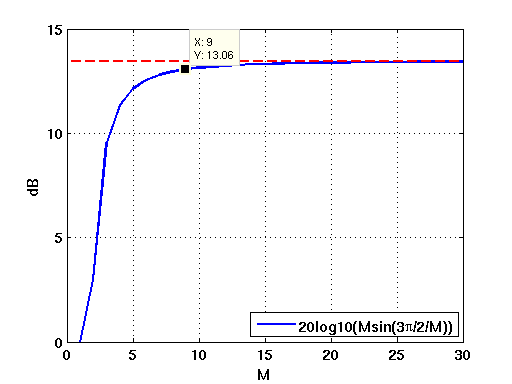 The magnitude response of the rectangle window in dB is plotted in Figure 1. Figure 1: Magnitude Response of Rectangle Window (dB). Now, how large should be for this approximation to be valid? 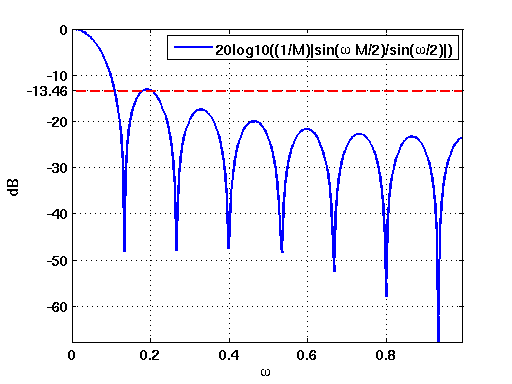 Judging from Figure 2, the approximation is valid for . Figure 2: Convergence of Peak Side-lobe Ratio with respect to the filter length M.
I'm what the neural network in my brain feels what I am. This entry was posted in Signal Processing Theory and tagged Filter Design, Frequency Response, Peak Side-lobe Ratio, Rectangular Window, Window Function. Bookmark the permalink. So, as long as the no. of taps is greater than 8, the peak to side lobe ratio is maintained @ 13.5dB. Thanks for sharing. I believed filter of any length had this ratio. Similarly, for a linear antenna array, the main lobe to sidelobe difference is guaranteed to be 13.5dB only for more than 8 antenna elements. This is where 8 brings better understanding of the mathematical treatment of spatial filter. I don’t know much about antenna arrays but spatial filter is indeed an FIR filter. So, what you said — that if the number of taps is greater than 8, the main lobe to side-lobe difference is 13.5 dB — will be valid when the tap weights are same for every tap. Thus it is a filter with a rectangular window as the impulse response. But this is not in used in practice, no? Usually different weights are used which will improve the main-lobe to side-lobe ratio. Can you give any antenna theory reference which says that the ratio is 13.5 dB if the number of taps are greater than 8?